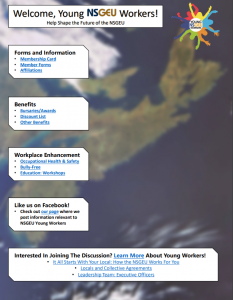 The Ad Hoc Young Workers Committee is dedicated to creating awareness of the NSGEU, while encouraging young workers to become more active within the labour movement. With the support of experienced activists, the committee engages members between the ages of 18 and 35 to try and promote succession planning and bridge the generational gap within the NSGEU and the workplace. Activism comes in many shapes and forms. The time is quickly approaching when our younger population is going to be faced with the reality that the responsibility of leadership and activism rests on our shoulders. Our committee’s goal is to be prepared when the time comes. If you’d like to find out how you can get involved in the NSGEU, you can reach out to your Local leadership, or contact us at inquiry@nsgeu.ca.